Add 1 Level 7 or lower Ritual Monster from your Deck to your hand, then you can add 1 Ritual Spell from your GY to your hand. 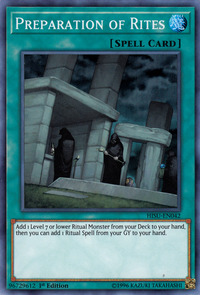 Ritual Raven appears in this card's artwork. This card's artwork is part of a series of events in the order of Preparation of Rites → Pre-Preparation of Rites → Urgent Ritual Art → Advanced Ritual Art. There is a glitch when using this card in World Championship 2010 where even though you are presented the choice to retrieve a Ritual Spell, the game will force you to add one to your hand from the Graveyard if possible, regardless of whether you choose to or not. The effects of this card are not resolved simultaneously. They resolve in the order written on the card. "Drastic Drop Off" cannot be activated if a Ritual Spell Card is added to your hand by this effect. The effect to add a Ritual Spell Card to your hand does not target. You choose the card upon resolution. 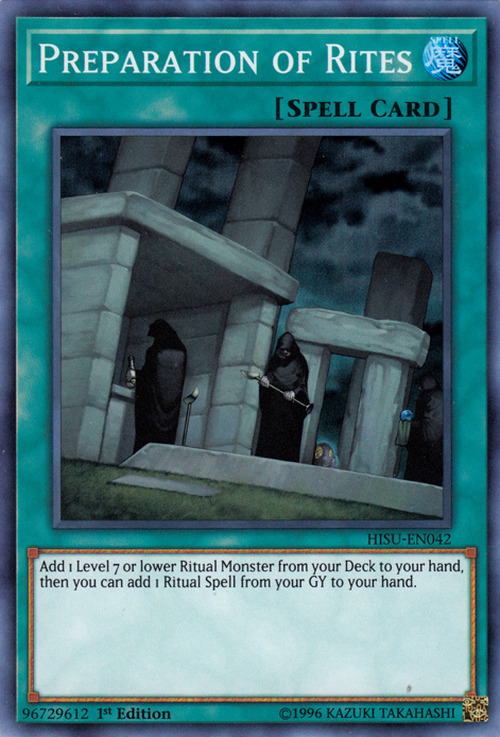 If you have a Ritual Monster in your Deck, then you can activate "Preparation of Rites" even if you do not have any Ritual Spell Cards in your Graveyard. For "Preparation of Rites", the resolution which adds a Ritual Monster from your Deck to your hand does not occur at the same time as the resolution which adds a Ritual Spell Card from your Graveyard to your hand. You add the Ritual Monster from your Deck to your hand, and then you add the Ritual Spell Card from your Graveyard to your hand. : When resolving "Preparation of Rites", are the Ritual Monster and the Ritual Spell Card added to your hand at the same time? Example: After "Preparation of Rites" resolves, you cannot activate "Drastic Drop Off" because you miss the timing. The effect of "Preparation of Rites" which adds a Ritual Spell Card from your Graveyard to your hand does not target. The Ritual Spell Card to be added to your hand is selected when resolving the effect of "Preparation of Rites". : Does the effect of "Preparation of Rites" target?